Yogurt Dots are the same size as all their counterparts, their shape being similar to a half-inch eraser head crossed with a bullet. They come in five flavors, which I found interesting because they arenâ€™t just yogurt versions of the original Dots. Strawberry: Has a really subtle flavor to it that resembles artificial strawberry syrup. Banana: Has a much bolder and recognizable flavor of the fruit it is trying to mimic, without being overpowering like many banana flavors often are. I liked this one. Orange: Has the basic orange flavor down, but lacks the citrus that makes it a true orange flavor. Itâ€™s like eating an orange-flavored popsicle versus eating a real orange. Blackberry: I was most excited to try this flavor as berries tend to be my personal favorite in the gummy world, though also one of the most difficult to replicate in candy form. I didnâ€™t taste blackberry with this one as much as I had some overtones of blackberry pie, which still missed even that mark, to my disappointment. Lemon-Lime: Tastes like the lime flavor of the original Dots, which is artificial and not sour. Those who like the original green Dots will probably like this one as well, for the same reasons. What makes Yogurt Dots live up to their name is that only the top third of the candy is the fruit flavor, with the bottom two-thirds being yogurt based. The yogurt portion isnâ€™t really that appealing to me, tasting like a gelatin version of a yogurt covered pretzel. Even worse, the yogurt flavor is so overpowering that you can’t even smell the fruit flavors when biting into them, much less taste any of the fruit tip. In order to get a sense of what the fruit tips actually tasted like for this review, I had to bite them off and eat them separate of the yogurt portion. 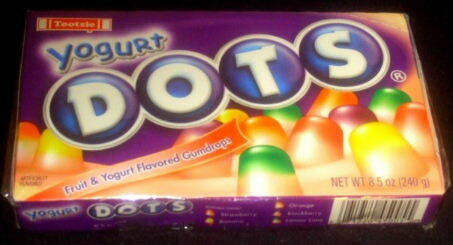 A nice thing about Yogurt Dots is that they are not hard, unlike their predecessors. They are slightly sticky, but do not get stuck in your teeth. I think Tootsie has made improvements on this front and hope they incorporate whatever method accomplished this feat into their other brands. Overall, I didnâ€™t much care for these, and would have probably just settled for the fruit flavors without the yogurt flavor interfering. On an interesting side note, a fellow Candy Addict recommended I try these frozen. When chilled, the fruit flavor is remarkably enhanced, but the candy then sticks to your teeth like the original does; when refrigerated, you get a nice mix of the room temperature and frozen characteristics, and I found these to be most appealing. Hmmm….. I haven’t seen these yet. I tried these about a year ago, and the yogurtiness (word?) really added to their appeal. They still come in WAY TOO BIG of a box though. Oh man, Dots are one of my favorite candies. To the Walgreens, Candy-mobile! Yogurt Dots?! What a way to ruin a great candy! I don’t think I’ll be trying these in the near future.